/ When Is A Papaya Ripe Ready To Eat? This Is It! When Is A Papaya Ripe Ready To Eat? This Is It! Nicknamed as “fruit of the angels” by the Italian explorer and colonizer Christopher Columbus, papaya is a popular herb in tropical areas, most specifically Southeast Asia. It can only grow in warm areas as it cannot tolerate cold or freezing temperatures. These days, you can plant some in zones 10 to 12 in the US and other colder countries. Most people regard papaya as a tree but botanically speaking, it’s a large herb with thin and soft trunk but no branches or barks. It usually grows to a height that’s easily reached, unlike coconut. However, some may grow tall as high as 20 up to 30 feet. Although it grows and produces fruits fast, this kind of plant easily dies within a short period of time. 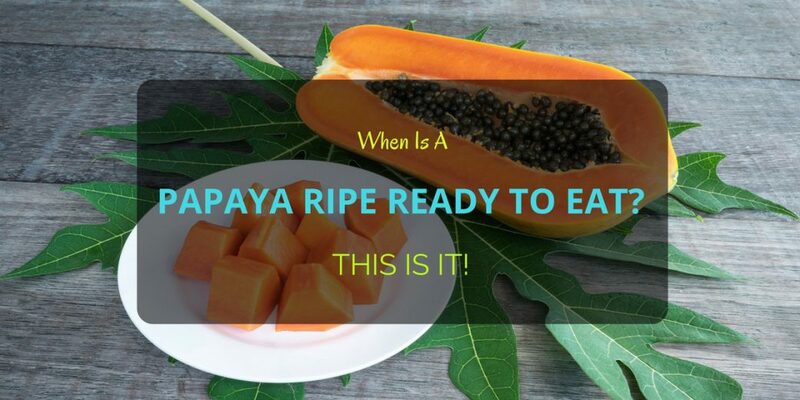 When Is A Papaya Ripe Ready To Eat? Moreover, papaya is distinctive by its sweet, soft and juicy fruit. In a few countries like Indonesia, the leaves of this plant are also eaten but must be cooked. On this post, we’re just going to focus on the fruit. When is a papaya ripe and ready to harvest for consumption? The fruits of papaya can be harvested within the first year of planting. As long as you take care of it properly and regularly, more than a dozen of fruits can be enjoyed as a sumptuous dessert, snack or meal. The obvious indication when is a papaya ripe is through the color of its flesh. It must be orange that can be sometimes a combination of red and pink. You won’t know this until you slice and open it up. But luckily, the skin also changes from green to yellow or orange. If 1/2 to 3/4 of the skin has turned to yellow-orange, it indicates the fruit is already ripe. If it’s full green, the flesh is most likely green too and tastes bland. So, do not pick it too early! But many Asian dishes use the green flesh of papaya. You can cook it with some moringa leaves, squash and sweet potatoes. That’s a delicious vegetable dish by the way. Yes, papaya is sometimes considered as a vegetable when cooked. Another indication when is a papaya ripe is to touch its skin. It must be soft when gently touched but not too soft or else that’s already overripe. As mentioned, papaya produces fruit within the first year, particularly within 8 to 10 months after planting. In warmer areas, it may even earlier than that period, 6 months. A hot climate plays a big role in the production of papaya fruits. Like most plants, papaya blooms flowers. This is a clue to start monitoring and patiently wait when is a papaya ripe. Once they bloom, it takes 5 to 8 months before you can pick the fruits. That is during the first year after planting. As a matter of fact, papaya flowers blossom a few times in a year. That means you can pick as many fruits around 30 to 150 in 12 months. But take note of the type of flowers. Male flowers do not product fruits, so you must pay attention to the female flowers. How to differentiate them? Female flowers have short stems with a bulge at the base, naturally for ovary, while male flowers are mostly seen attached in long stalks. Some people may not be unfortunate to grow papaya, but doesn’t mean they can’t have any supply from a local store. When buying, it’s best to choose papaya that is half green and half yellow in color. A good fruit can be easily chosen by its smooth and unblemished skin. Some may be more yellow with green specks. Harvested or bought, papaya can be eaten within a week as long as it stays in the fridge. If you place papaya with other fruits like avocado or banana, it ripens much faster. Some fruits product ethylene and that aids in ripening. Now that we have figured out when is a papaya ripe, how can you harvest it? It’s very simple, just twist the papaya fruit from the plant to break it. You may also need to cut the stem level. As you wait for it to perfectly ripen, it’s best to place in a room temperature, usually for a day or two. Once ripe, you can refrigerate it for 4 to 7 days. Learning when is a papaya ripe is very basic. But this kind of fruit can easily over ripe and that’s an important thing to keep in mind. Do not pick it when most of the skin is yellow, unless you eat it on the same day you harvest it. Nevertheless, it is fun picking papaya fruit.